We arrived at our B&B just fifteen minutes down the road from the Highland Games. After checking in and finding our rooms we soon ended up at the inn’s bar, soon enjoying pints of ale and wine. Whoever thought of calling an appetizer ‘Haggis Bon-Bons’ must have won the award for best oxymoron printed on a menu. The four of us thought of trying them and then opted for more sedate fare. Up and at ‘em with a full English/Scottish breakfast (save for the Blood Pudding which we graciously declined) in our tummies we rode to Dundee where Max promised a fascinating view of the first ship specifically built for polar explorations. Nigel, whom we met in Peterhead and who lived in Dundee, had mentioned s/v DISCOVERY, Robert Scott’s first Antarctica’s ship, was on exhibit in this city. From that day onward, this ship became a magnet for my husband. until we finally decided to call using our satellite phone. Good thing for they were waiting for us at another historic ship down the way. Reunited we started our journey of RRS (Royal Research Ship) DISCOVERY beginning with its construction starting in 1900. DISCOVERY was the first ship in the world built specifically for polar and Antarctica research and the last example of one still around. Dundee’s shipyard was one of two vendors bidding on this ship, being one of the few still capable of crafting a three-masted wooden sailing ship in this age of iron and steam-powered vessels. With an original quote of over £50,000, the final price was eventually reduced to just over £33,000. Fortunately, the adjustments didn’t affect the ship’s strength or performance as DISCOVERY took part in three major explorations: The British National Antarctic Expedition 1901-04; The DISCOVERY Oceanographic Expedition 1925-27; and, the British Australian New Zealand Research Expedition 1929-31. What is more interesting (to me) are some of the crew this ship carried during its voyages: Captain Robert Falcon Scott; Dr. Edward Wilson (fifth from left below at the launch); Sir Ernest Shackleton (seventh from left); Tom Crean; Sir Alister Hardy; and, Sir Douglas Mawson. I know the names but Max knows their bios, trust me. Although this initial voyage was a joint endeavor for scientific exploration between the Royal Society (RS) and the Royal Geographic Society (RGS), a military officer (Scott) was selected as commander. The choice of a military leader over a scientist caused some sour grapes between the two societies; but, RGS under the leadership of a former naval officer won this battle placing Scott in command. Surprisingly, but maybe not considering the time period, only one out of the 45 crew had polar experience, and it wasn’t Scott (it was the French scientist Louis Bernacci). to unique features such as the ability to lift the rudder and propeller inside the hull to avoid damage from the ice (or repair damage caused by the ice). 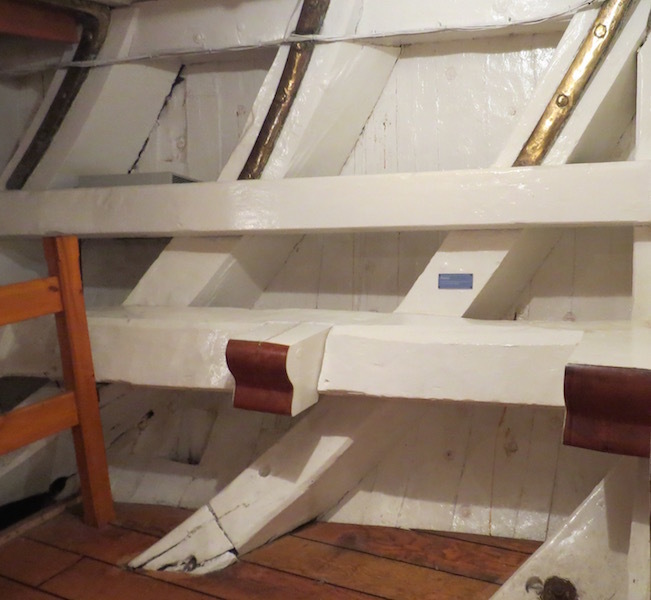 One of the interesting design components were the salt boxes where rock salt was poured between the inner and outer hulls. If water seeped in, the salt helped preserve the wood. Judy mentioned their great-grandfather’s 32 ft sloop, Juanona, after which our boat is named, also had rock salt poured into the bilge during winter storage. Hmmm… I wonder if a salty Smithfield Ham could have been part of our Atlantic Ocean provisioning. Many museums create opportunities to engage youngsters’ interests; and, this one definitely catered to kids as Doug quickly proved his mastery of lading and unlading a ship’s cargo and balancing the load in the ship. Must say, it did look like fun. After perusing the unique design, crew biographies and descriptions of the voyages, we headed outside to explore the actual ship. It was big and it was definitely not something you’d find me on. All I could think of was what one’s day (and night) would have been like living on this vessel still smelling of tar pitch. The odor alone would have me slapping seasick patches on and soaking rooms (and people) with lavender spray. What some find bracing, my husband included, I find a wee bit too sailor-ish. Yet, it is fascinating to walk the decks and below and think where this ship had been. The size of the wheels, both fore and aft, were impressive and we all took turns posing as salt-bitten sailors. as well as the salt box slits. I roamed the officers’ quarters where I snapped shots of Shackleton’s and Scott’s cabins. Max went back aboard and below to take a photo of where some cross beams had been mounted from port to starboard along the entire length of the ship. They kept the hull from being crushed by ice. The beams were cut out during a later renovation. After several hours we were all ready to leave the polar region and head towards a much more civilized endeavor: golf.